With ‘the Beast from the East’ firmly behind us (fingers crossed) I’ve never felt more in need of a luxury break! I’m not sure if it’s the fact I couldn’t leave the house for five days, or just the unending rain and snow, but I’ve become a little obsessed with the Epicurean Collection – a group of stunning, independent boutique inns sprinkled around the south of England. Until the end of the month, the Epicurean Collection are offering an incredible offer – a one night stay, inclusive of breakfast, will set you back only £69. Considering how beautiful all the inns are, and the stunning locations you’ll find them in, this feels like beyond a bargain. 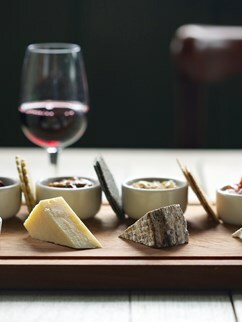 You can upgrade your experience with the Epicurean Collection’s range of specially curated experiences designed to help you get the most out of your countryside stay. 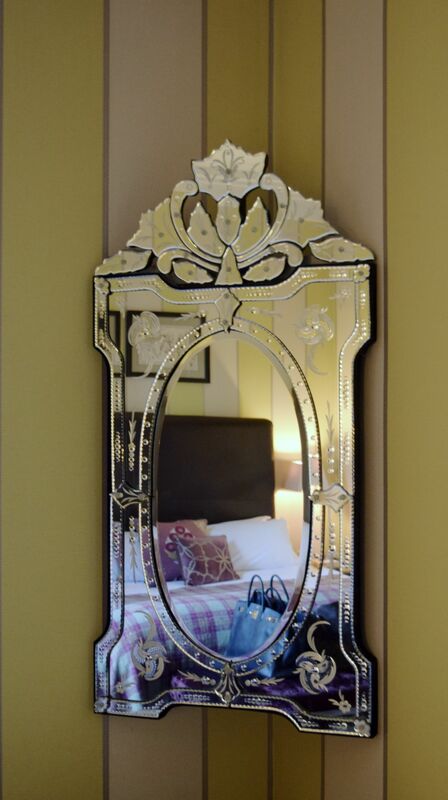 All the experiences include a stay for two people at one of the boutique inns on a bed, dinner and breakfast basis. The experiences range from watercolour workshops, William Blake exhibitions, champagne teas, cocktails masterclasses, spa getaways, wakeboarding, warbird flights and much more. The inns are below (complete with links) so you can plan your breaks away! Don’t forget to visit this month, so you can make the most of this incredible offer! A relaxed Hampshire setting is the ultimate Highclere hideaway. This harbour-side inn is the perfect spot for a relaxing coastal treat. A classic country pub with a quirky-cosy design and delicious menu of British fare. Experience classic English sophistication in the heart of rural Hampshire, near Winchester. Escape to the smallest hamlet in England to this cosy countryside inn. Just an hour from London, offering a cosy retreat from city life. Seasonal food, stylish décor and boutique mod cons makes this a romantic get-away favourite. 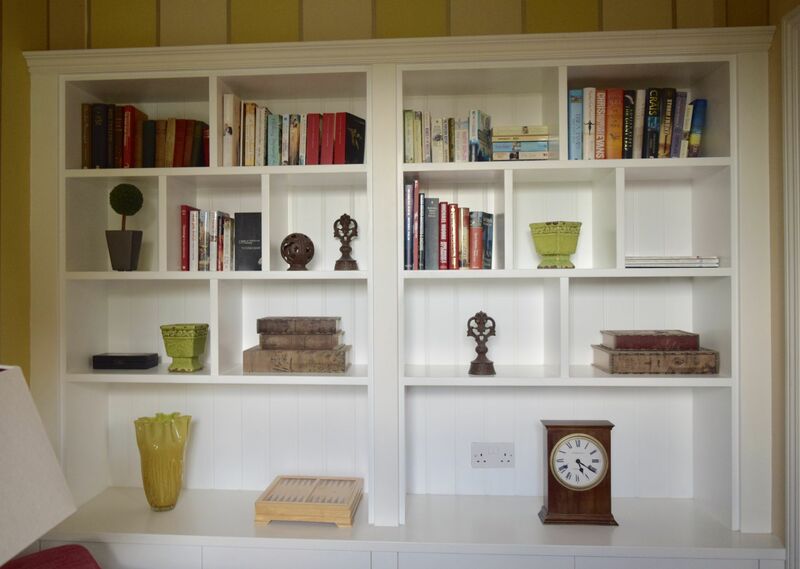 Combining modern elegance with rustic warmth and homely comforts. A tradition inn exuding warmth, comfort and character. Country house turn cosy Cotswolds inn brimming with English charm, fine dining and a relaxed atmosphere. A quintessentially English country escape within the beautiful Cotswolds countryside. A fabulous riverside inn located in the heart of Oxfordshire countryside. Nestled in the foothills of the South Downs this award-winning boutique inn defines countryside elegance. West Sussex’s best kept secret, just moments from Gatwick airport yet offering a peaceful countryside stay. The perfect place to savour exquisite cuisine or a drink in the traditional cosy bar. Just a stone’s throw away from Goodwood Estate, this inn never fails to delight. Beautifully refurbished interiors make this Victorian inn and ideal country hideaway. The thatched roof inn features cosy fires and tempting seasonal fare. Things are given a contemporary twist at this luxury country bolthole. I went to school and university in St. Andrews, so it’s fair to say the town has a bit of a hold on my heart. It’s probably where I’ve spent the most time in one place, and I love heading back every so often to explore my old haunts. One of the spots which has undergone a complete transformation since my time as an undergraduate, is the new Kinnettles Hotel, which opened in the summer of last year. 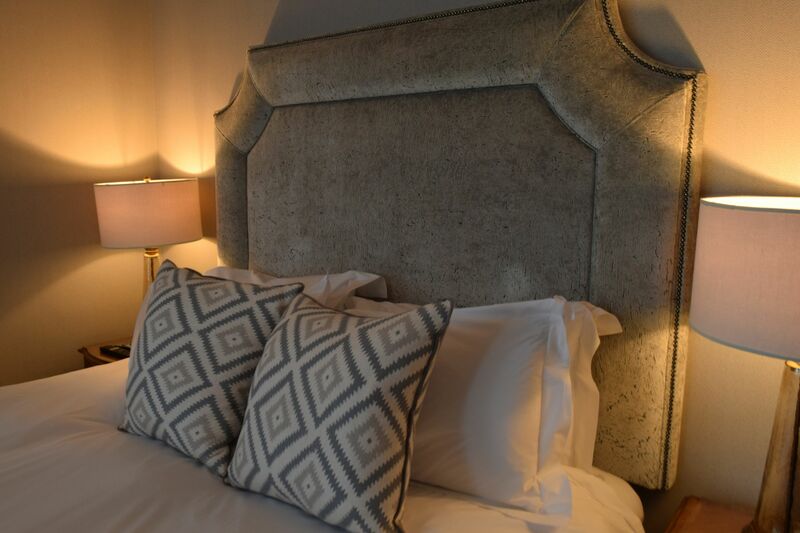 Previously a casual restaurant with St. Andrews’ only nightclub in the basement, the hotel is now a true sanctuary in the centre of town, complete with spa, bar and incredible restaurant. 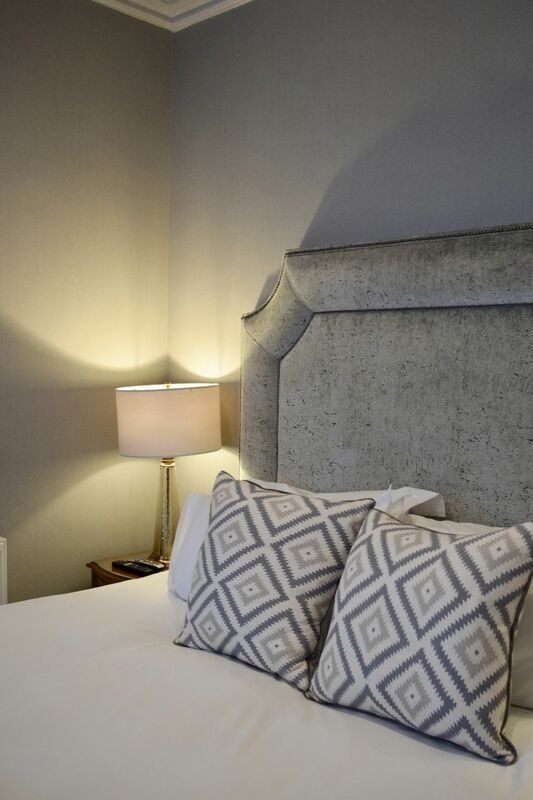 With only nine rooms, Kinnettles is a wonderfully intimate hotel, and it’s perfect if you’re looking for a plush retreat in the town. 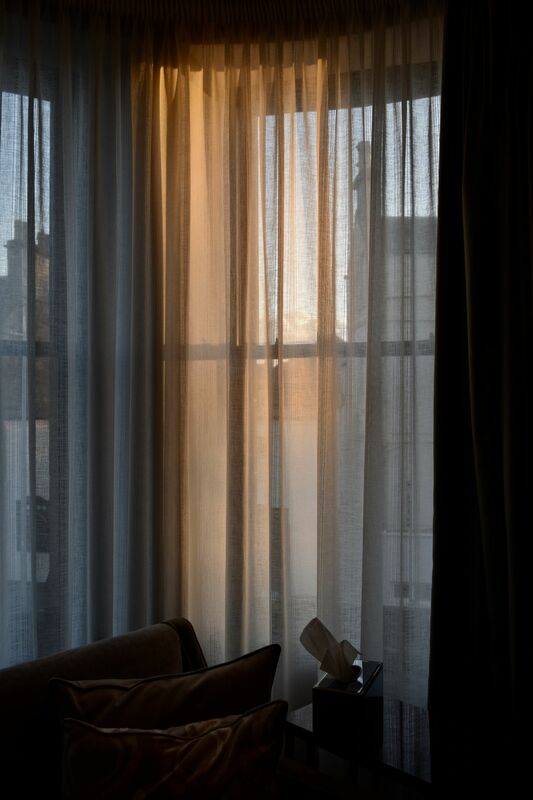 We stayed in Room 3, a gorgeous haven of plush greys, which looks out onto North Street through a curved window. 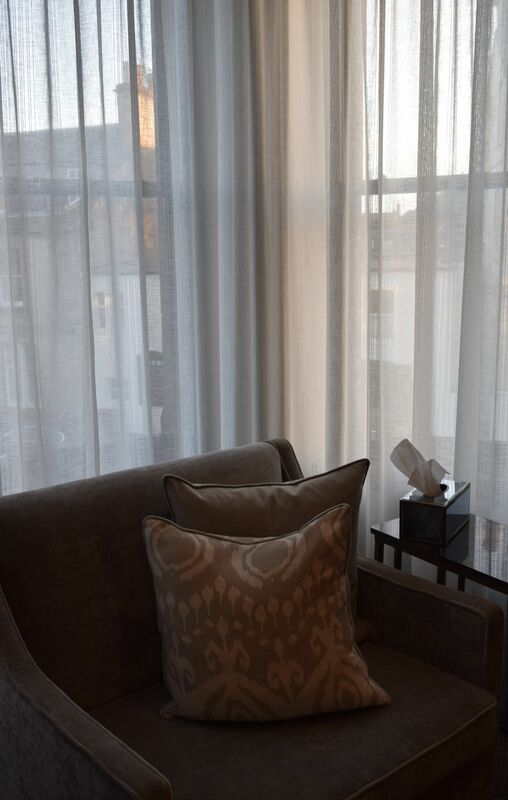 The attention to detail in the furnishing of the hotel is evident – every corner has been furnished, and it’s provided some serious interiors inspiration for me! 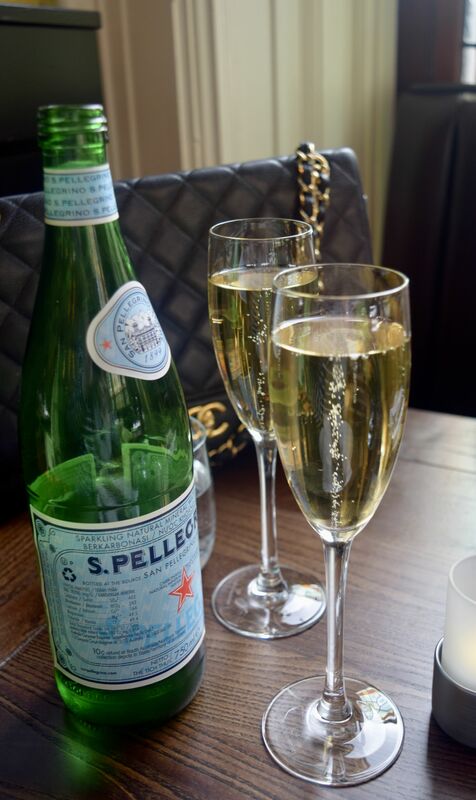 We popped in on Sunday, to enjoy a leisurely end to the weekend, and we couldn’t have had a better time! The room itself is glorious – a huge cloud of a bed, with beautifully crisp linens, as well as a small sitting area to sit and enjoy the buzz of town. 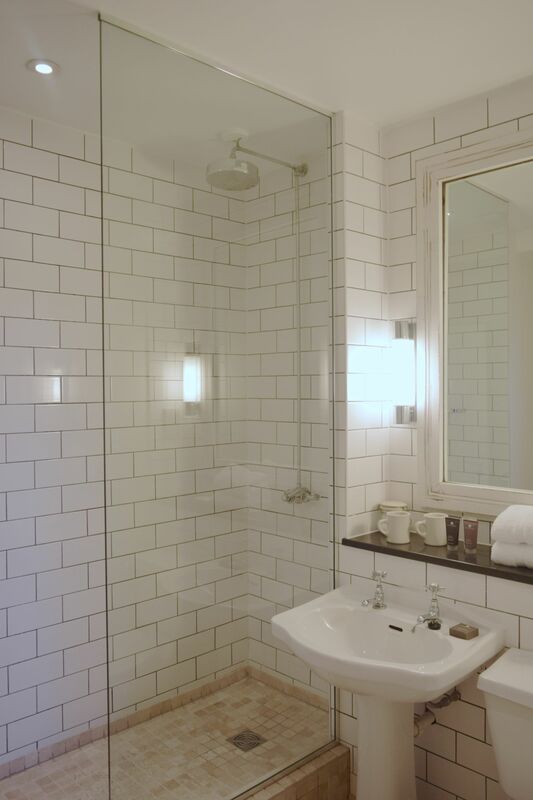 The room’s ensuite bathroom is the stuff of dreams! The only room in the hotel with a bath, I couldn’t have loved it more! 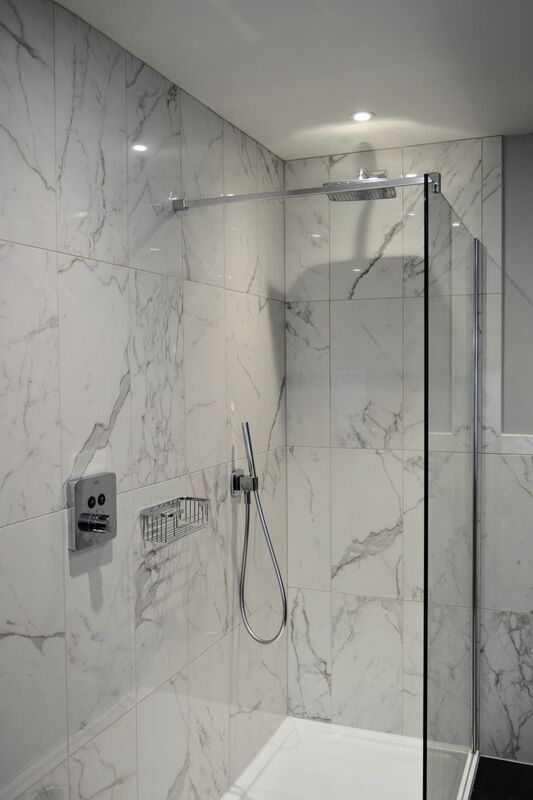 The shower was equally glorious – encased in marble, and benefitting from fabulous water pressure – it made an early Monday morning (almost) bearable! 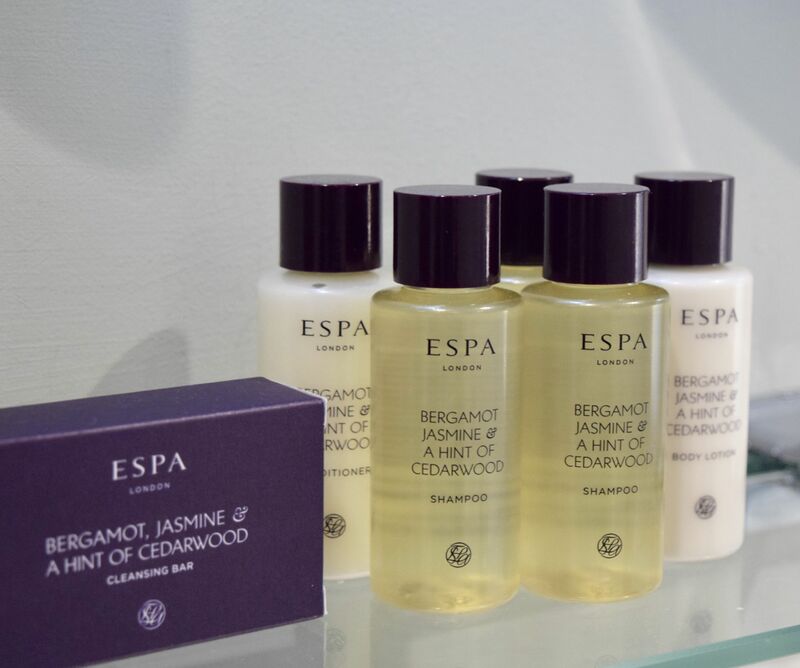 As if the marble-clad bathroom wasn’t glorious enough, they come stocked with luxe ESPA toiletries. The bathroom was even scented with an ESPA diffuser, which made it feel even more enjoyable to relax in a hot bubble bath! 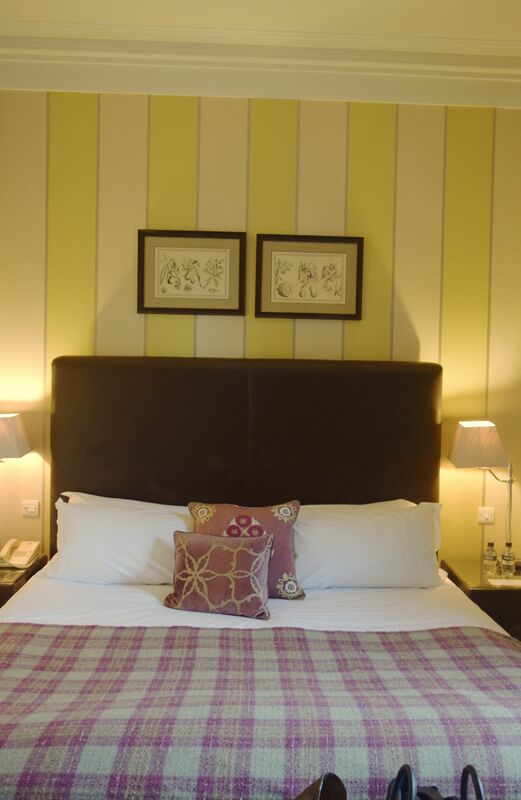 The rooms in Kinnettles, really are nothing like anything else in St. Andrews! We were lucky enough to head downstairs for dinner at the hotel restaurant (review to come!) but I should have spent hours sitting in the bay window watching the comings and goings! The bed was absolute perfection too! Crisp linens and puffy pillows meant that drifting off to sleep was, pardon the pun, an absolute dream. I just wish I hadn’t needed to buzz through to Edinburgh first thing Monday morning, as I could have easily enjoyed a lazy afternoon in bed! The whole stay was so glorious, we’re already planning a return visit! As someone who spends most days in Scotland’s capital, I always enjoy a great day out! So, when I was invited to pop through and see some of the best spots in the city, I absolutely jumped at the chance! 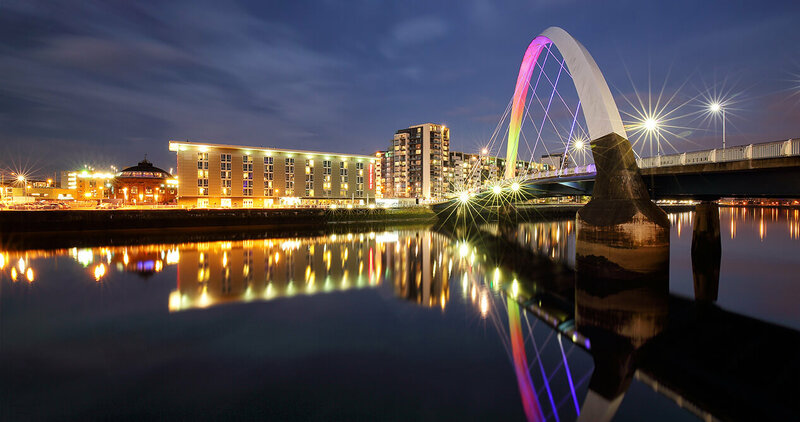 Travelling through from Edinburgh to Glasgow couldn’t be easier – you can do what we did and jump in the car (it’s about a 40 minute drive), or if you’d rather kick back, there is a regular train service which deposits you right in the city centre. 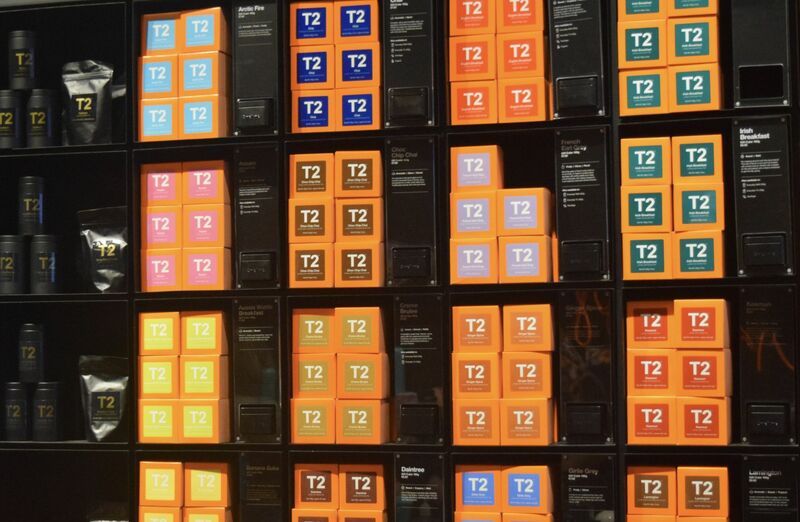 After parking at Buchanan Galleries, we wandered down Buchanan Street to pop into the new T2 store. If you’re a tea lover like I am, this is a must-visit destination! With loose leaf teas piled from floor to ceiling, there are blends for everyone, and the staff couldn’t be more helpful. With a chance to taste a variety of blends, including a delicious matcha ritual and turmeric latte, I felt like a kid in a candy store! It took a while, but eventually I managed to select a tea blend, as well as a super handy infuser (I picked the purple one here) which I’ve been using pretty much daily ever since! From T2, our next stop was Laings in the Argyll Arcade. The jewellery is one which I’ve explored in Edinburgh (you can read about my visit here), so getting to see three of their Glasgow outlets was great fun! 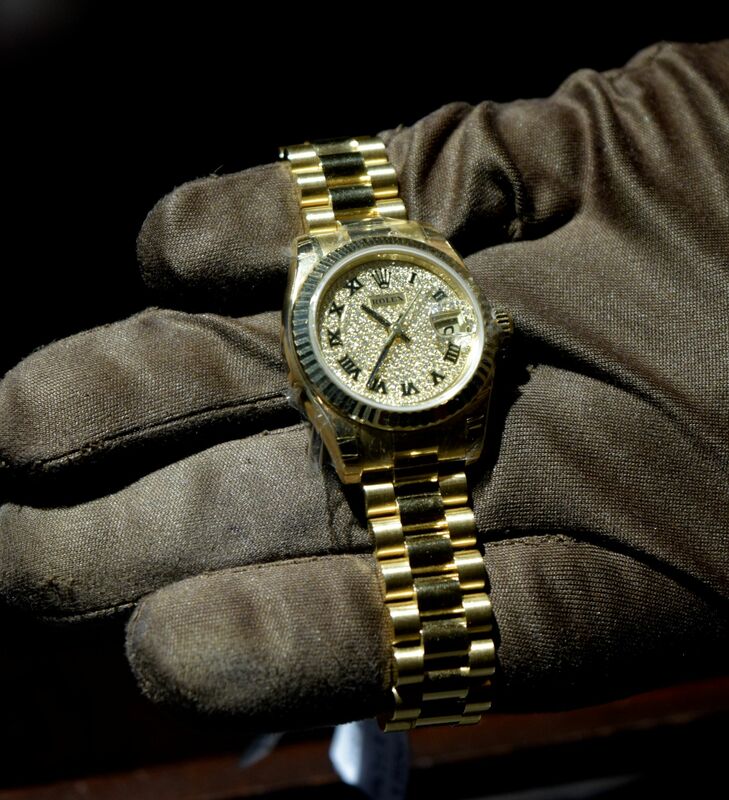 Depending in whether you’re in the market for a new watch, a specially commissioned piece or a luxury treat, Laings has something for you! I spent a good hour looking at the best of what Laings has to offer – an I have to say, my wish list has grown considerably! From examining ‘Hearts on Fire’ diamonds with specialist equipment to oohing over necklaces and rings, it was such a special start to the day! After all that glamour, we were absolutely famished, so headed over to Merchant City for brunch at Hutcheson’s City Grill. 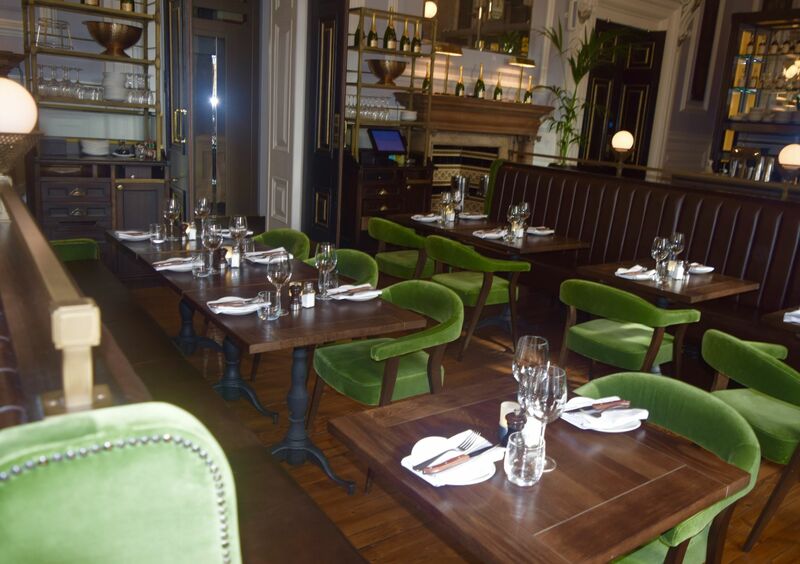 It’s a real mainstay for Glasgow, with a space to eat both upstairs and downstairs depending on your preference. We headed upstairs, to enjoy a leisurely brunch. As we perused the menu we were treated to a couple of glasses of champagne. The dining room is absolutely stunning! We oohed and ahh’d over the architecture and all of the velvet seats, whilst deciding on our choices. We couldn’t resist The Hutchesons Fry (£12) which was perhaps the heartiest breakfast option on the menu! 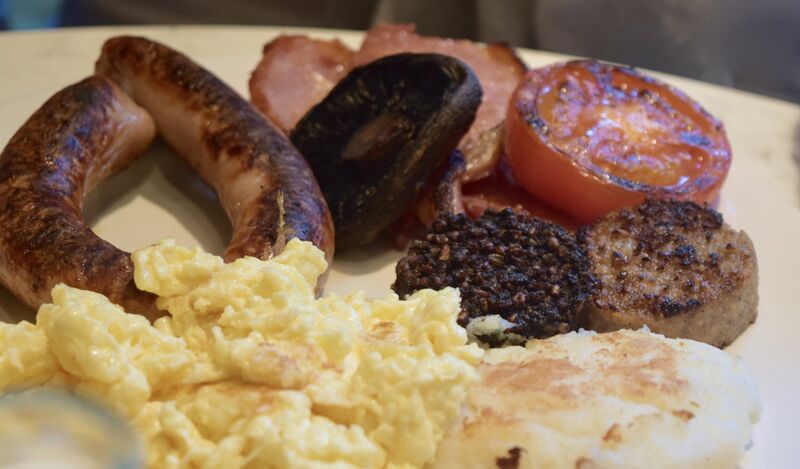 A wonderfully herby sausage was served alongside crisp bacon, cooked mushrooms, scrambled eggs, beans and Stornaway Black Pudding. 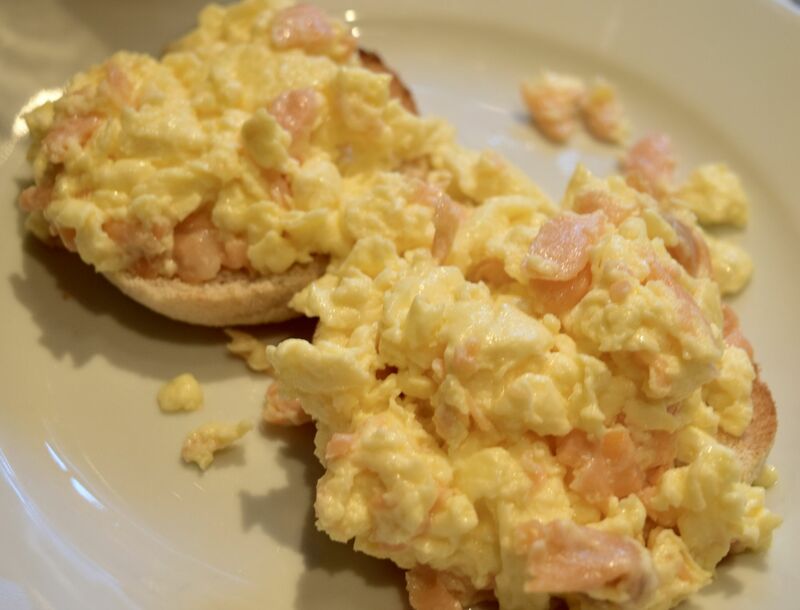 I went for the Smoked Scottish Salmon & Scrambled Eggs (£10) which came with a toasted English muffin. It was a gorgeous dish, and I love how nicely presented it was. After enjoying our brunch, we headed downstairs to explore the rest of Hutcheson’s City Grill. 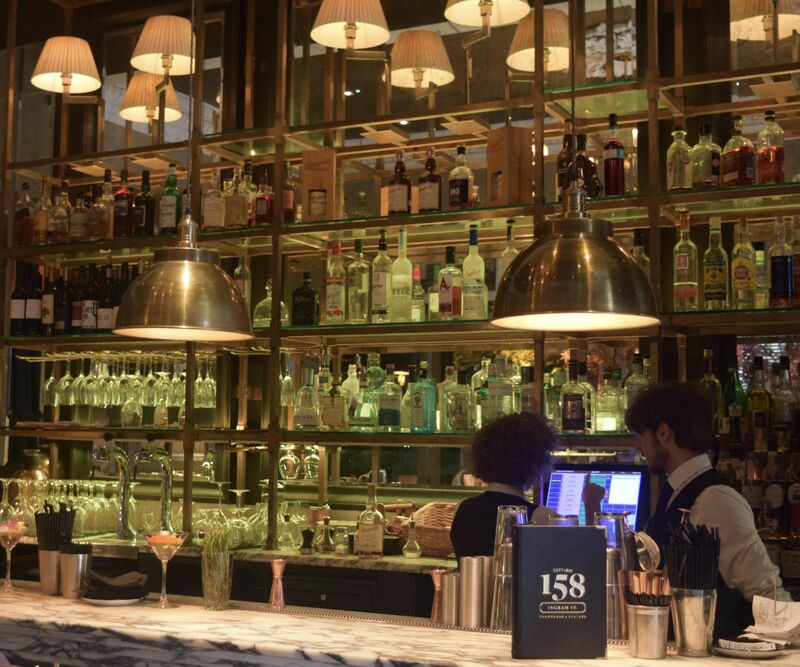 The bar is absolutely glorious – all marble and glass, and I’ll be heading here for drinks the next time I’m through! After fuelling up, it was time to get down to the serious business of shopping! 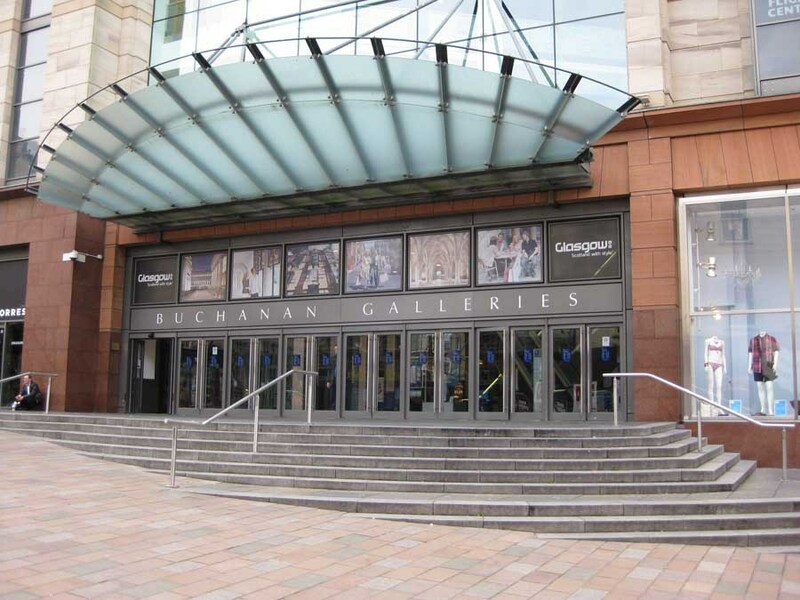 Buchanan Galleries is one of the city’s best shopping malls, with stores ranging from Accessorize to Hollister, as well as a large John Lewis. We window shopped for a while, and although I was going to stock up on a few pieces of makeup in Boots (they have a great selection of premium brands) I ended up being sensible and picking up a couple of home bits from John Lewis. Once we dropped the bags off in the car (after all, who wants to lug sheets around town with them?!?) we headed down Buchanan Street for a bit of a peruse. As well as having all the regular high street stores, Glasgow also has a huge Apple store, an Urban Outfitters and Frasers – the king of the city’s department stores. If you love beauty as much as I do – Frasers is a real must visit on a trip to Glasgow. 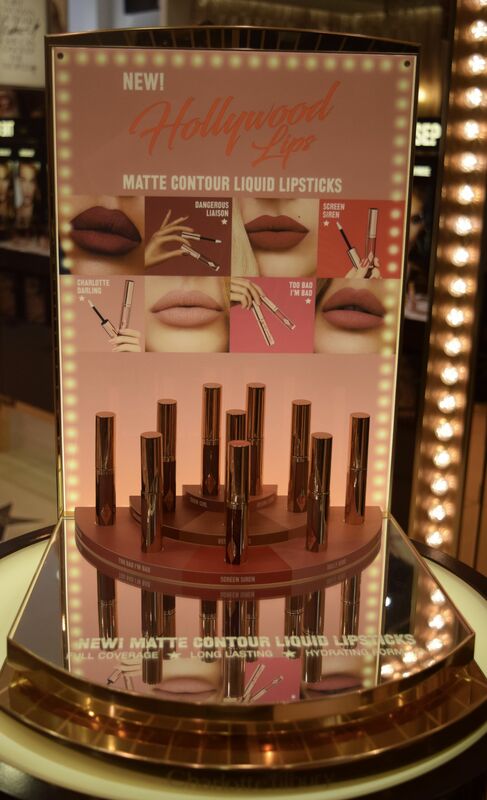 As well as stocking all your regular premium brands, they have Scotland’s only Charlotte Tilbury counter, as well as the Chanel counter of your dreams. They even stock the brand’s Les Exclusifs perfume collection, so it’s where I head whenever I’m running low on their Gardenia. After all that shopping, it was time for supper – so we headed back over to the Corinthian Club for supper. The building itself is absolutely stunning – it looks like a wedding cake with swirls of rococo plasterwork and possibly Glasgow’s most picturesque dining room. It was a lovely mix of couples, families and friends, all enjoying suppers or stacks of late afternoon tea. In a bit of a blogger fail, we both opted for the Fillet Steak (£29.95). And really, who could blame us? 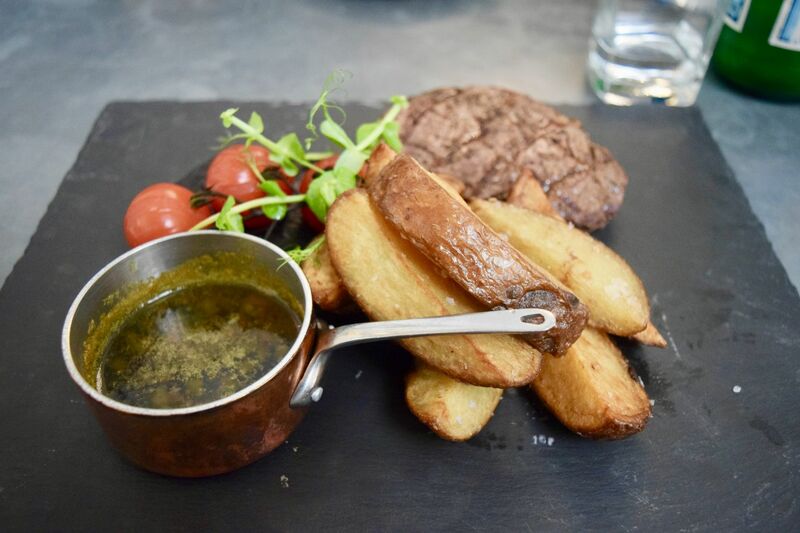 Served on a slate with a copper pan of Cafe de Paris, crispy thick cut chips, cooked cherry tomatoes and a peppery watercress salad. 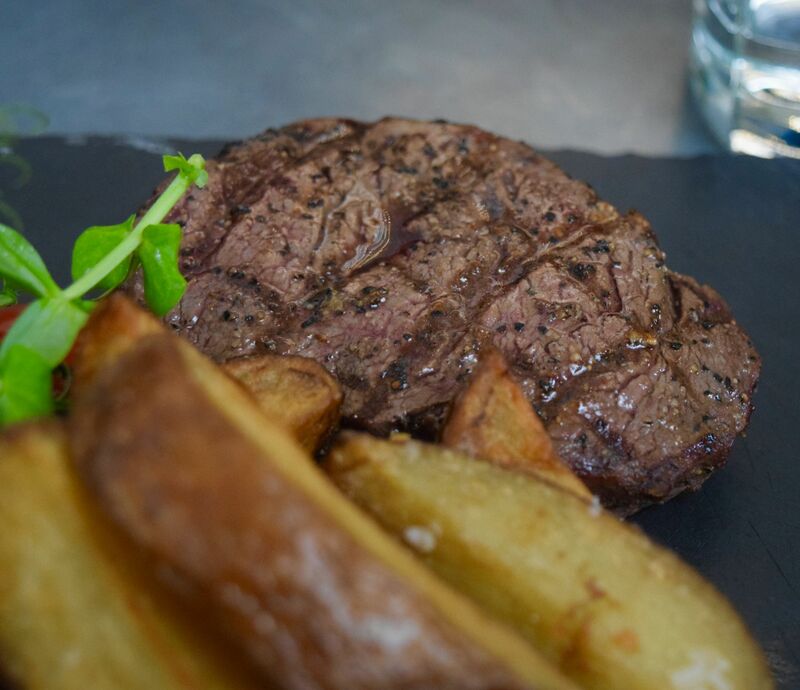 It was a deliciously indulgent way to finish the day – the juicy meat with the mustardy Cafe de Paris butter was fabulous, whilst the peppery watercress said give the dish some zing! We had a fabulous day out! Thank you so much for T2, Laings, Hutcheson’s City Grill, Buchanan Galleries, House of Fraser at the Corinthian Club for having us! Whenever I’ve got a weekend free, and not too many plans, I typically tend to head down south, and end up in Cheshire. It’s a gorgeous part of the country, with beautiful countryside, postcard-perfect little villages, and surprisingly good shopping (one of my favourites is Selfridges at the Trafford Centre). 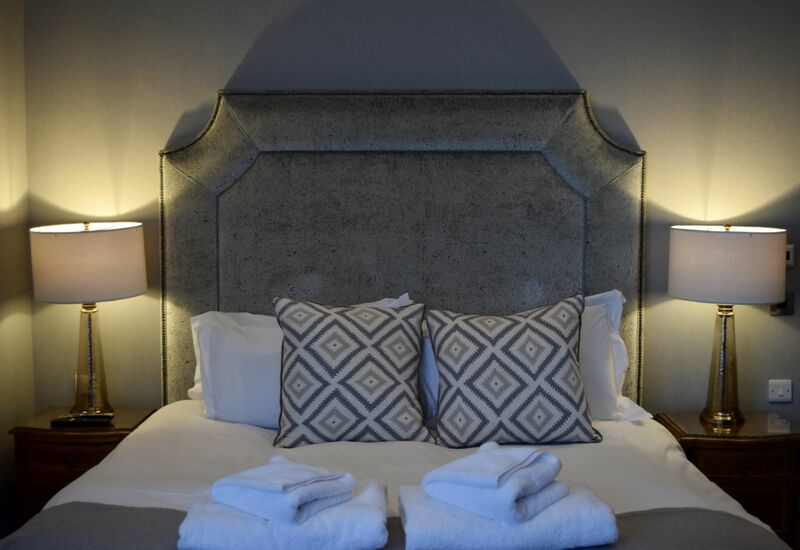 A few weeks back, when were were heading up north from our stay in the Cotswolds, we figured we’d add a pitstop, and sped a night at the glorious Eleven Didsbury Park. For all the times I’ve visited Cheshire, I don’t think I’ve ever been to Didsbury, but it’s a charming spot – very residential with beautiful Victorian houses. It’s also close to Manchester airport, as well as the Trafford Centre, so if you want a little mini-break prior to jetting off, or if you’re in the mood for some retail therapy, this is a perfect spot to visit. We were staying in a gorgeous Eclectic Villa Room, which included a sumptuous super king sized bed, separate sitting area, bathtub and even a dressing room! We had been driving up from Oxfordshire on the day we arrived, so having such a gorgeous room to arrive to was an absolute dream. 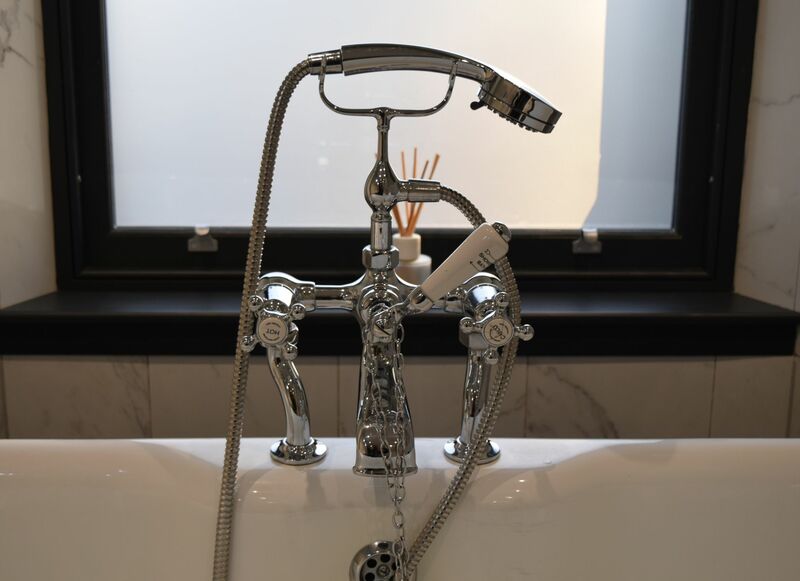 We had enjoyed supper in Alderley Edge, so the first thing to do was draw a hot bubble bath and relax a bit. The bath is tucked into the corner of the room, and is the perfect spot to read a book and unwind. 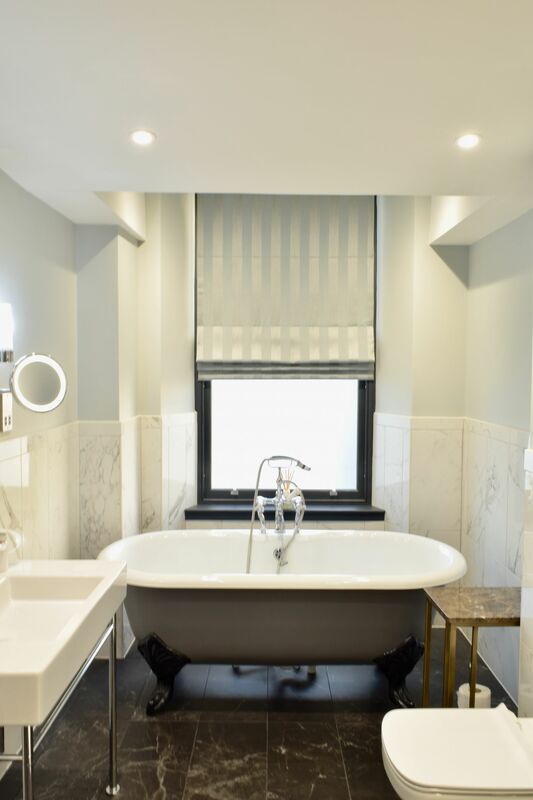 The ensuite bathroom was equally luxurious, with a roomy rainfall shower, and it came fully stocked with lush Temple Spa toiletries and plenty of fluffy towels. After an absolutely heavenly night’s sleep (seriously, the bed was insanely comfortable) we headed downstairs to enjoy breakfast. 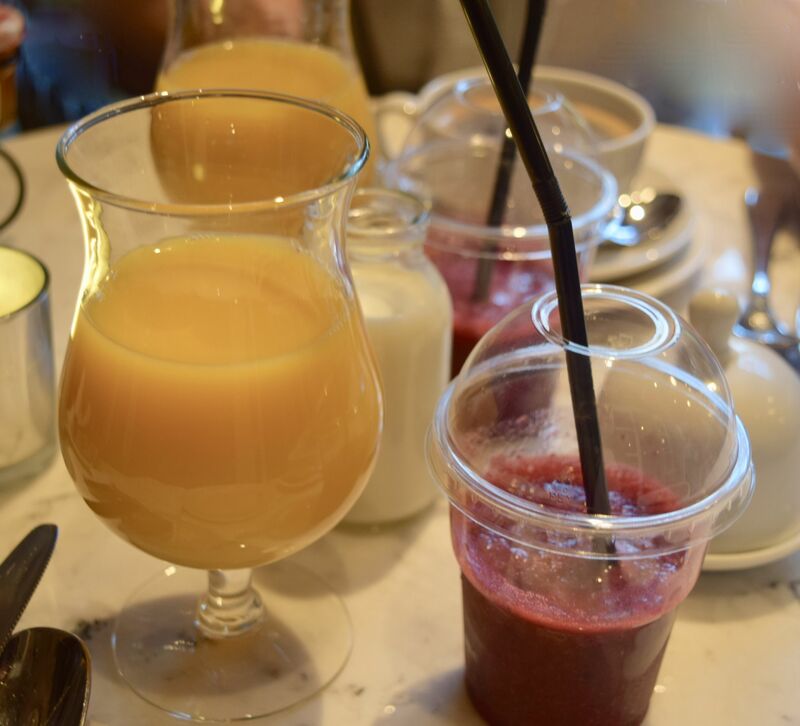 We kicked things off with a freshly squeezed orange juice and some fresh berry smoothies. We couldn’t resist ordering a full English breakfast. With sausages, scrambled eggs, bacon, mushroom, tomato and black pudding, it was a perfect way to set ourselves up for the long drive up north. I opted for the Scrambled eggs and smoked salmon on an English Muffin. 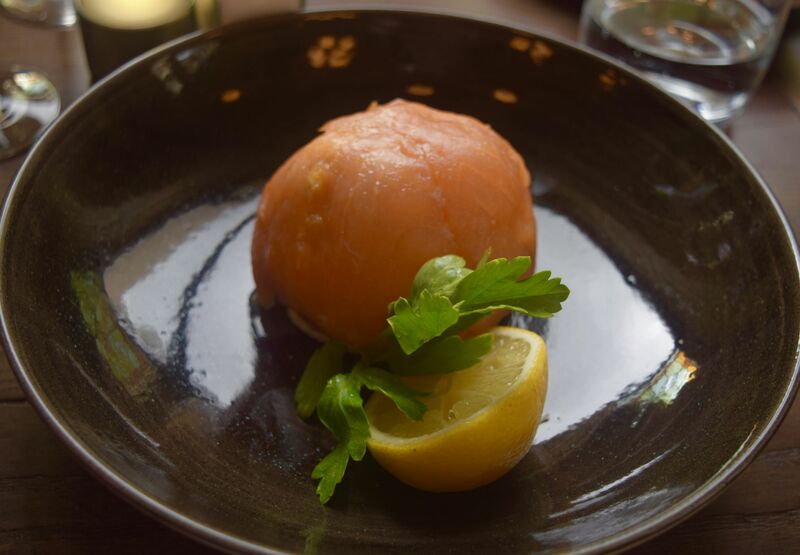 Light and fluffy eggs went perfectly with the salmon, and it was a delicious end to our little stay-cation! Thank you so much to Eleven Didsbury Park for having us! You can find out more about the hotel here. When I was down in the Cotswolds last month, we took a day to drive through to Oxford and spend the day at the Ashmolean Museum. It’s somewhere I’ve wanted to visit for years, and I am happy to say, it did not disappoint! We spent the whole day weaving from exhibit to exhibit – the museum has everything from Egyptian mummies to modern art, so as you can imagine, there was a lot to see! 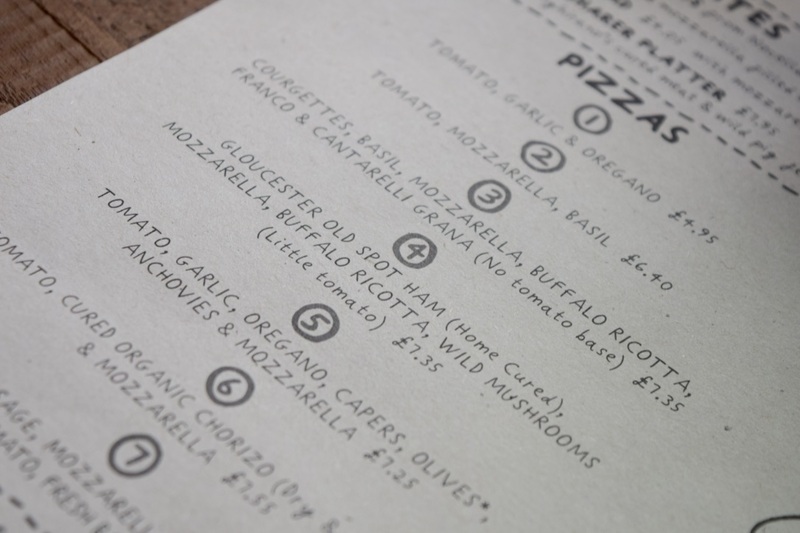 So to fuel up, we headed around the corner to new Oxford spot Franco Manca. The restaurant only opened up a couple of months back. Located in the centre of town, it’s a roomy spot, which was filled with a mix of students, locals and tourists, all munching on Oxford’s best pizza. 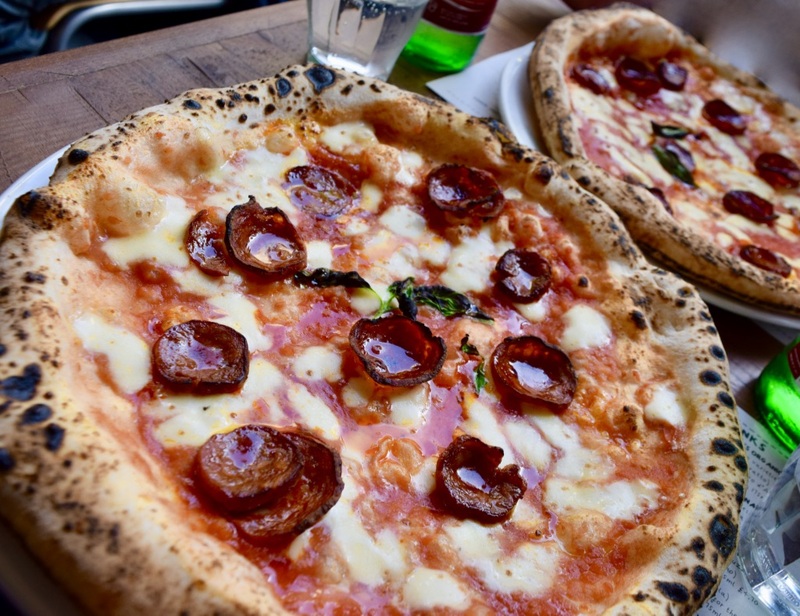 If you are a student, Franco Manca has an incredible offer currently going on – every Monday & Tuesday, students can receive a No Logo beer or Aperol Spritz on the house when you buy any pizza! Just use the buzz word ‘Brixton 2008’ & show your student card. This is running until 31st December, so there’s still tonnes of time to enjoy! 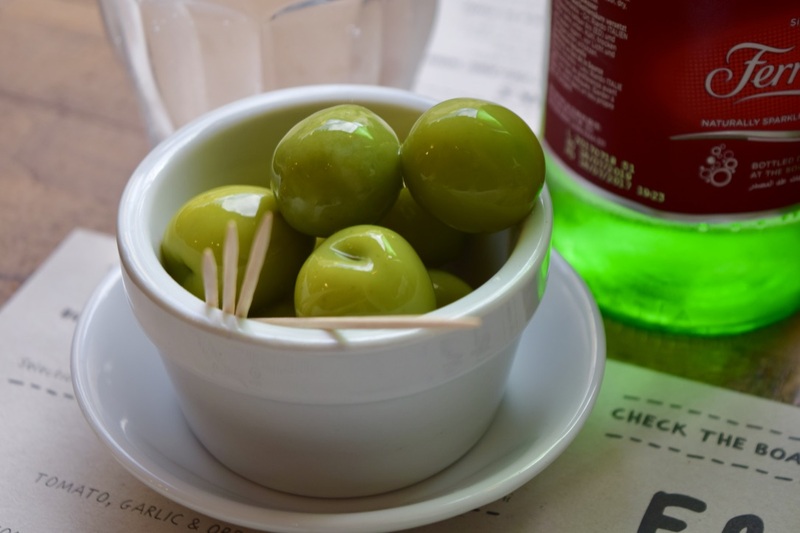 As we perused the menu, we munched on Green Olives (£2.35). 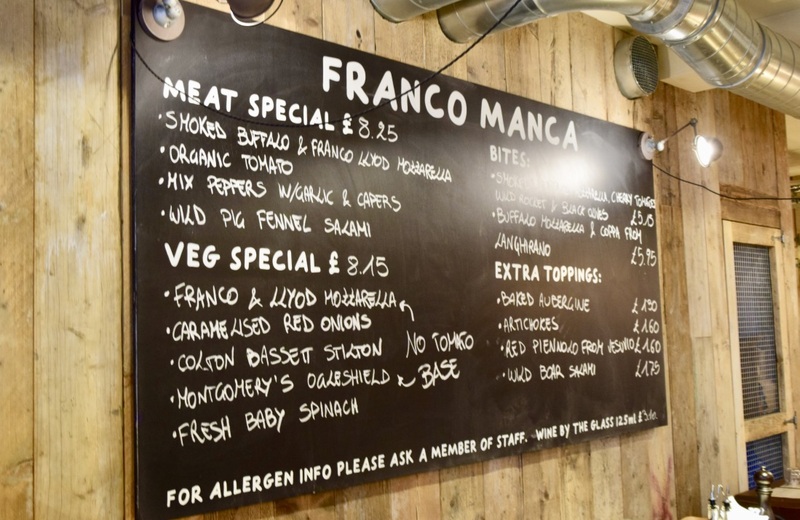 I love how simple the menu at Franco Manca is – mains consist of 7 main pizzas, as well as a few daily specials, and some salads. We were absolutely famished after day spent at the museum, we couldn’t resist starting off with a Garlic Bread with Mozzarella (£4.95). Served piping hot, it was the definition of melty, cheese and garlic-y goodness! We shared one between two of us, and it was a seriously generous portion! Made with the same slough rising sour dough as the pizzas, it was a perfect start to the meal. In what can only be classed as something of a review fail, neither of us could resist Pizza 6 (£7.55)- which comes with tomato, cured chorizo [dry + semi-dry] & mozzarella. For some reason I developed something of a chorizo habit on the trip, and the promise of it on a pizza was too much to resist. Franco Manca cook their pizzas in wood burning ovens which reach temperatures of up to 900 degrees, so when they get to the table, they’re piping hot, and covered in the most glorious of toppings. Ours, topped with copious slices of chorizo was equal parts cheesy and spicy. I just loved how the meat was quite thickly sliced, so you could really appreciate all that great flavour. 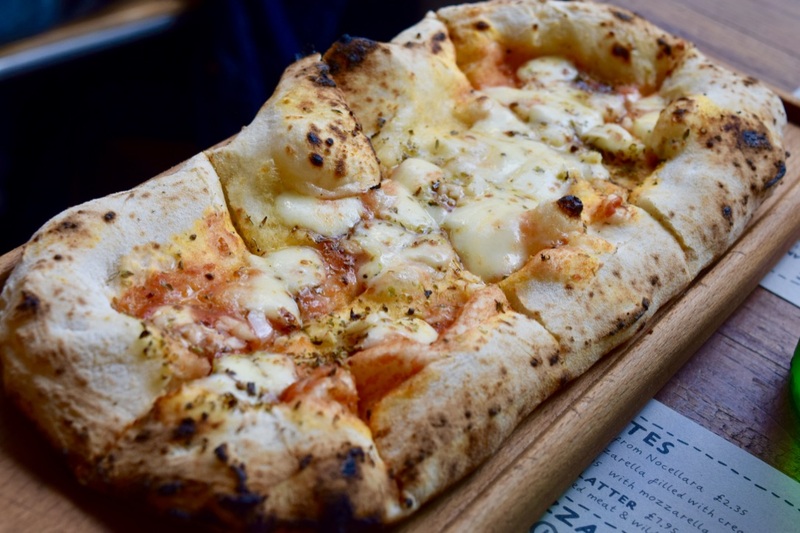 The wood stove gives the crust a delicious flavour – and Franco Manca want to make sure you eat them all up! If you’re not usually a crust lover (which, admittedly, I am) you can order a selection of homemade dips to enjoy! Even though we were absolutely stuffed from the main course, we could resit in indulging in a little Italian dessert. 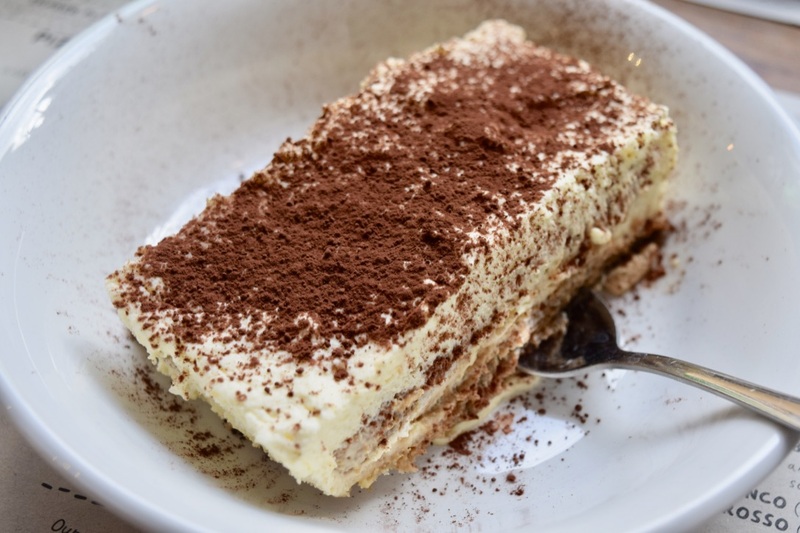 As with the menu for the main course, the choice of dessert is wonderfully simple – for us though, there was only one choice – a classic tiramisu (£3.95) to share! Presented simply, the slab of pudding was an airy cloud of whipped cream and boozy sponge. Topped with a dusting of cocoa powder, we savoured spoonfuls of it with coffee, as we planned our days ahead. It was an absolutely wonderful way to refuel after a day spent in Oxford’s best museum! 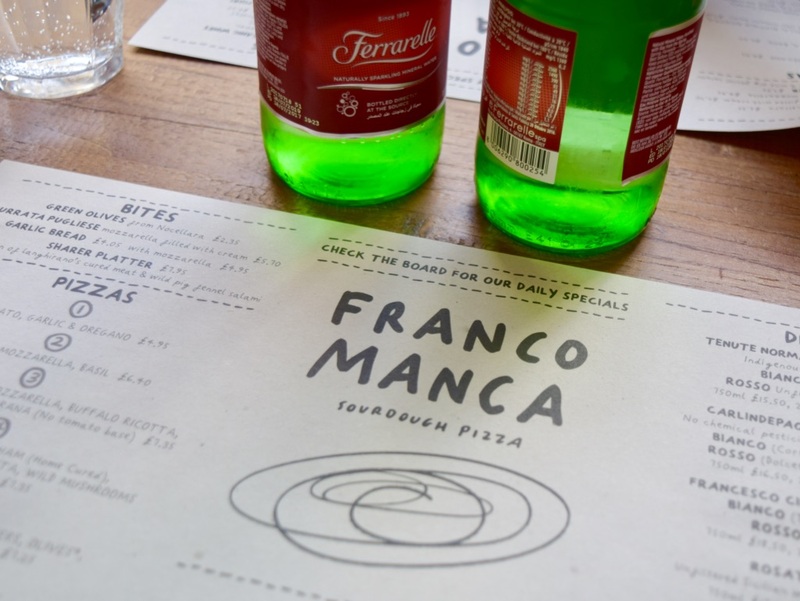 You can find out more about Franco Manca, and see their menu here.